This silver and gray necklace is both a fun diy project and a major fashion statement. Learn how to make a necklace with this project and you'll never buy one pre-made again. Start by creating the foundation of the necklace. Open a 9mm jump ring and slide two hematite loops onto it. Repeat this technique to connect 11 hematite loops in a chain. Separate two 5" lengths of medium curb chain (Since the links on the chain aren't soldered, you can separate them using chain nose pliers rather than cutting the links apart). 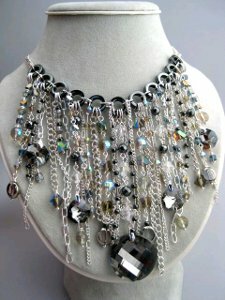 Use two 9mm jump rings to connect one of the chain pieces to each end of the connected hematite loops as shown. Open the last link on one side of the necklace and connect it to a lobster clasp. Use a 6mm jump ring to attach a 1 3/4" section of elongated cable chain to the other end of the necklace. String a 8mm faceted round onto a head pin and attach it to the last link on the elongated cable chain. Separate the chain into the following lengths: - Small cable chain: two 2 ¼", two 2 ¾", two 3" (attach a 4mm jump ring to one end of each) - Small Figaro chain: two 1 ¼", two 2 ¼", two 3", two 3 ¼", two 4" - Medium curb chain: two 2 1/2" (string a bead onto a head pin and attach it to the last link with a wrapped loop) and two 4" lengths - Elongated curb chain: two 1", two 3 ½"
Now, we'll start building the necklace from the center and work our way toward the ends of the connected hematite loops. String a 8mm clear bead onto an eye pin and make a basic loop; repeat two more times. String a 6mm hematite round onto an eye pin and make a basic loop; repeat once more. Connect the bead links in an alternating pattern. Cut the large silver bail off the top of the pendant so only the pinch bail and loop are remaining, then attach it to the last clear bead link. Connect a 9mm jump ring to the first bead link and attach it to the hematite loop at the center of the necklace (hematite loop #6). String a 8mm v-cut onto an eye pin and make a basic loop; repeat two more times. String a 8mm faceted round onto an eye pin and make a basic loop; repeat once more. Connect the bead links in an alternating pattern. String a 10mm table cut and a 4mm hematite round onto an eye pin. Make a wrapped loop to attach it to the last v-cut bead on the chain. Repeat this entire step to make a matching dangle. Use 9mm jump rings to attach one to hematite loop #5 and one to hematite loop #7 on the necklace. String a 8mm clear bead onto an eye pin and make a basic loop; repeat once more. String a 6mm hematite round onto an eye pin and make a basic loop; repeat once more. Connect the bead links in this pattern: hematite, clear, hematite, clear. Cut the large silver bail off the top of a pinch bail finding so only the pinch bail and loop are remaining, then attach the pinch bail to a faceted disk. Connect the pinch bail loop to the last clear bead link. String a 8mm faceted round onto a head pin and make a wrapped loop to connect it to the lower hole on the disk. Repeat this entire step to make a matching dangle. Use 9mm jump rings to attach one to hematite loop #4 and one to hematite loop #8 on the necklace. String a 8mm v-cut bead onto a head pin, then string the following: 4mm hematite, 6/0 clear, 4mm bicone, 6/0 clear, 4mm hematite, 6/0 clear, 4mm bicone, 6/0 clear, 4mm hematite. Make a simple loop above the top bead. Repeat this entire step to make a matching dangle. Use 9mm jump rings to attach one to hematite loop #3 and one to hematite #9 on the necklace. Cut the large silver bail off the top of a pinch bail finding so only the pinch bail and loop are remaining, then attach the pinch bail to a faceted disk. Open the last link on a 1 ¼" length of elongated curb chain and connect it to the pinch bail loop. String a 4mm v-cut bead onto a head pin and make a wrapped loop to connect it to the lower hole on the disk. Repeat this entire step to make a matching dangle. Use 9mm jump rings to attach one to hematite loop #2 and one to hematite loop #10 on the necklace. String a 8mm faceted round on a head pin, then string six 6/0 clear beads alternating with five 4mm v-cut beads as shown. Make a simple loop above the top bead. Use 9mm jump rings to attach one to hematite loop #1 and one to hematite loop #11 on the necklace. Cut a 3 ½" piece of beading wire. Use chain nose pliers to flatten a #0 crimp bead onto the end of the wire. String a 4mm hematite bead onto the wire, leave a 1/8" space and attach another crimp and hematite bead; repeat for 11 total beads on the wire. Pass the wire through a #1 crimp bead and the jump ring between hematite loops #5 and #6. Pass the wire back through the crimp bead to make a loop, then crimp it. Use a 4mm jump ring to attach a 3" length of Figaro chain onto the same jump ring between hematite loops #5 and #6. Repeat this entire step to make another set of matching dangles and attach them to the jump ring between hematite loops #6 and #7. Cut a 3" piece of beading wire. Use chain nose pliers to flatten a #0 crimp bead onto the end of the wire. String a 4mm bicone onto the wire, leave a 1/8" space and attach another crimp and bicone; repeat for 6 total beads on the wire. Pass the wire through a #1 crimp bead and the jump ring between hematite loops #4 and #5. Pass the wire back through the crimp bead to make a loop, then crimp it. Repeat this entire step to make another set of matching dangles and attach them to the jump ring between hematite loops #7 and #8. String a 4mm v-cut onto an eye pin and make a basic loop; repeat three more times. String a 4mm bicone onto an eye pin and make a basic loop; repeat twice more. Connect the bead links in this order: v-cut, bicone, v-cut, bicone, v-cut, bicone, v-cut. String a 4mm bicone onto a head pin and make a wrapped loop to attach it to the last v-cut. Repeat this entire step to make a matching dangle. Attach the upper loop on one of the dangles to the jump ring between #3 and #4. Attach the other one between #8 and #9. Cut a 3 ½" piece of beading wire. Use chain nose pliers to flatten a #0 crimp bead onto the end of the wire. String a 4mm hematite bead onto the wire, leave a 1/8" space and attach another crimp and hematite bead; repeat for 9 total beads on the wire. Pass the wire through a #1 crimp bead and the jump ring between hematite loops #2 and #3. Pass the wire back through the crimp bead to make a loop, then crimp it. Repeat this entire step to make a matching dangle and attach it to the jump ring between hematite loops #9 and #10. String a 4mm v-cut onto an eye pin and make a basic loop; repeat once more. String a 4mm bicone onto an eye pin and make a basic loop; repeat three more times. String a 6mm faceted hematite bead onto an eye pin and make a basic loop. Connect the bead links in this order: bicone, v-cut, bicone, faceted hematite, bicone, v-cut, bicone. String a table cut bead onto a head pin and make a wrapped loop to attach it to the last bicone. Repeat this entire step to make a matching dangle. Attach the upper loop on one of the dangles to the jump ring between #1 and #2. Attach the other one between #10 and #11. This Silver and Gray Necklace is so beautiful. I love to wear both ordinary and costume jewelry. This one I don't have yet in my collection but I want one. It's so beautiful the color was carefully chosen, the beads and dangles used are very appropriate for the design of this necklace. I want to one!!! I wish I could make it myself. Cheers.